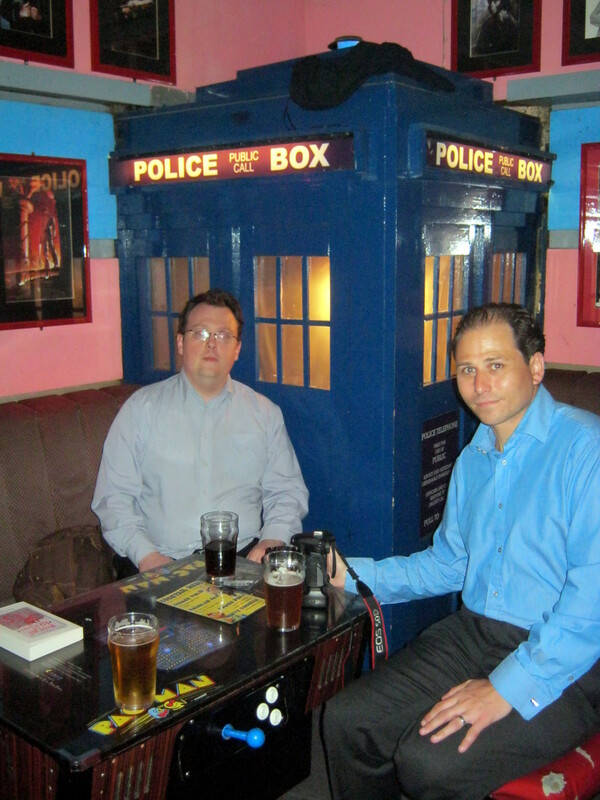 Me with Starburst columnist Ed Fortune in front of a TARDIS. The problem is that I have absolutely no idea what to wear. You see, for Steampunk it is easy. I actually have quite a selection of waistcoats and cravats and could even go so far as to get a top hat should I feel it necessary (I haven’t so far, mainly stuck with the waistcoat and cravat look and a gentleman would never wear a hat indoors…). Ok, I am not up there with the dedicated goggles and nerf guns with cogs on brigade but I can dress well enough to look like I belong. Most of the traders there are steampunked up to a greater or lesser extent and while there are usually many ‘non steampunks’ in the crowd, you don’t look like an idiot – the only person wearing costume. For World book night I might have had the ‘what to wear’ dilemma. However, the necessity of having to go straight from work to the venue (via the train station to pick up Frances Hardinge) meant that I was more or less limited to wearing what I wore at work. Since that day also coincidentally happened to be the day a member of the Royal Family was visiting work, this meant I was in a rather more formal shirt and tie than normal. In the photos you can even see the cufflinks. Though I had taken off the jacket and tie by that point. So, while I ponder these issues, I’d love to know your opinions. How do you expect a writer to be dressed when you meet them? What have authors you have met worn for cons and events? How much does a writer’s clothing matter? See, Frances has mastered it. She has the trademark hat, much like George R.R. Martin once had before he fetched a small fortune for it for charity. So perhaps it is time to consider branching out into signature gear. I’m certainly considering it, though at the moment have a real absence in certain areas of my wardrobe anyway. Yeah, Pratchett has a hat too. And Neil Gaiman has a leather jacket, or had as I’ve not seen him wear it for a while. I used to base rumours in Vampire LRP games on this very fact. I like Frances’s hat, and was honoured to see it close up at the World Book Night event. So are you saying the cravat and waistcoat is my thing? Well, you have the leather jacket and flying hat. The flight suit gets wheeled out for special occasions only, as it is very hot in there! Sadly, meeting the general public only counts selectively for that purpose, because the public do not want to meet me at my sweatiest, when we can avoid it. You could totally signature the cravat and waistcoat though.